Gov. 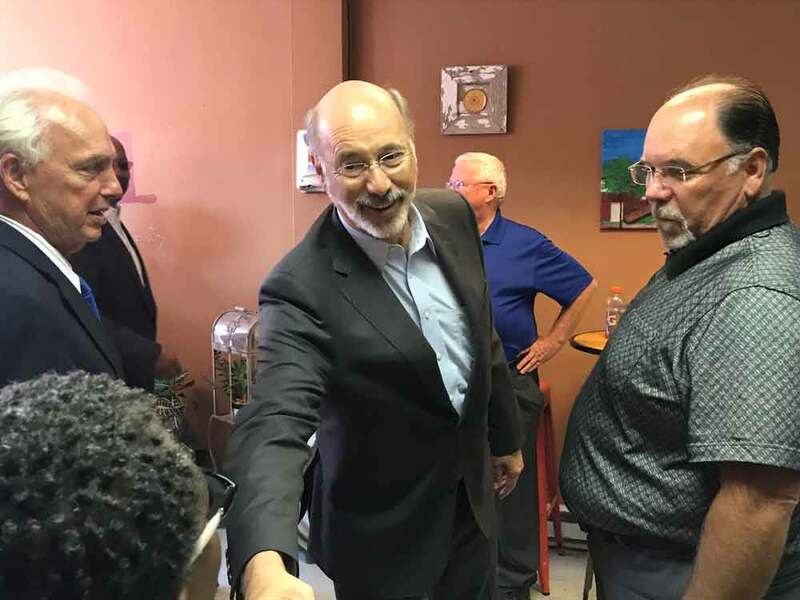 Tom Wolf, pictured with James DePetris, CEO of DEPG Associates (left) and City Council member Ed Simpson (right), greeted residents at Fuel City Cafe as he visited Coatesville Friday to tour the revitalization project that is now underway in the city. COATESVILLE – Gov. 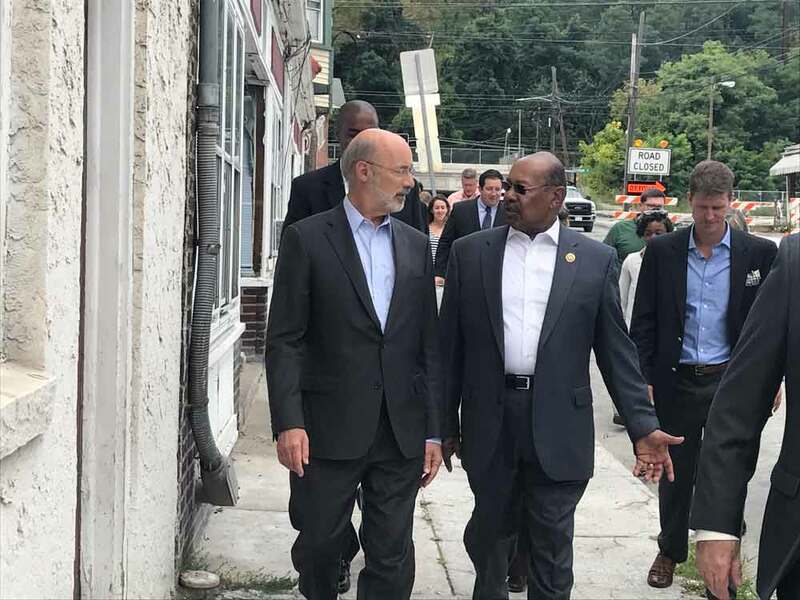 Tom Wolf paid a surprise visit to the city Friday afternoon to observe the revitalization efforts and tour the project sites that are now underway. 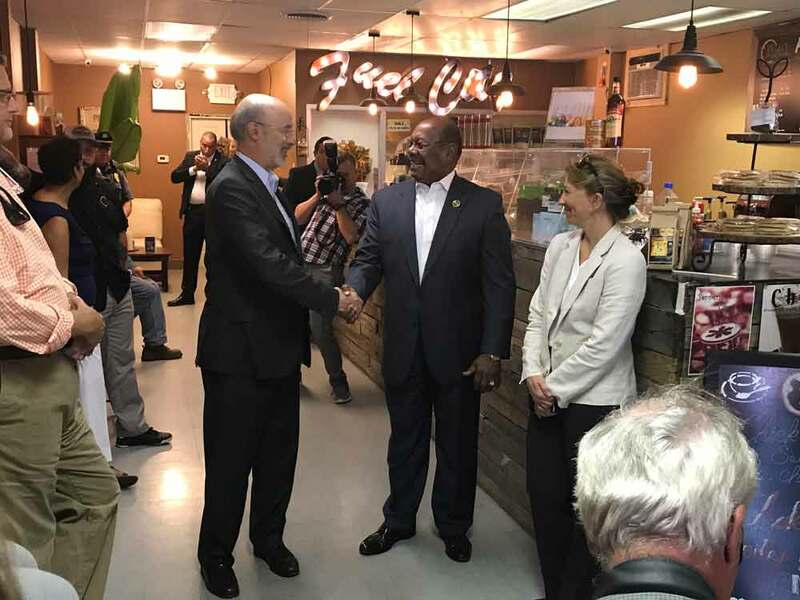 Wolf addressed the small crowd that had gathered at Fuel City Café in anticipation of his arrival, which also included State Rep. Harry Lewis (R-74), praising the revitalization project that is underway. “It’s really good to be here…to see what’s going on.” Wolf said. Wolf mentioned he often took the train through Coatesville on his way to and from Philadelphia and that he is looking forward to the improvements. He also praised the city for its efforts to make the neighborhoods good and safe for everyone, which, according to Wolf, is something every community should be doing. Before beginning the tour, Gov. Wolf stood with State Representative Harry Lewis (R-47) and Sonia Huntzinger of Coatesville’s 2nd Century Alliance and praised the efforts of all involved with the project and said he was impressed with how the city is working to bounce back. 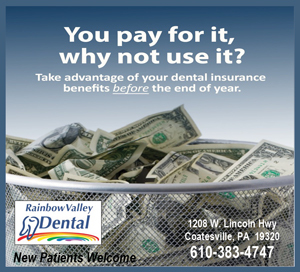 “It’s important, what you’re doing to bring Coatesville back…before Lukens Steel was the centerpiece of the economy here and created a lot of jobs…the steel industry has seen better days but you’re bouncing back.” Wolf said. Lewis thanked the governor for attending and pointed out the city officials who were also in attendance to take part in the walking tour, such as the City Manager Mike Trio, City Council member Ed Simpson, Sonia Huntzinger of Coatesville’s 2nd Century Alliance and CEO of DEPG Associates, Jim DePetris, who Lewis credits for working diligently to get this project moving in the right direction. “We are so proud of our town and now we’re on that jump to move forward…and it’s looking like we really are moving forward.” Lewis stated. The walking tour then began on North Third Avenue and continued up to Fleetwood Street, which is the site for the new train station. Plans for the station are still in design review but are projected to include repaving North Third Avenue, the addition of new sidewalks that will be accessible according to the Americans with Disabilities Act (ADA) as well as potential commercial office space. After viewing the future site of the new train station at the intersection of North Third Avenue and Fleetwood Street, Wolf and Lewis further discussed the details of the project as they made their way toward South First Ave and Lincoln Highway to the view the Gateway Redevelopment Project, which is now underway. From there, the tour continued to the intersection of South First Avenue and Lincoln Highway, which is the center of Coatesville’s Gateway Redevelopment Project. Crews have already begun the process of preparing the buildings to be demolished, which will take place next week. Construction of the new buildings is slated to begin shortly thereafter and is scheduled to reach completion in late 2018. The development project is expected to include two restaurants, one of which will be in the historic National Bank of Chester Valley building, as well as retail and office space and a secure parking area. “All eyes are on Coatesville to see what you’re doing here because it’s really important and I’m happy to be a part of this, I’m really impressed,” Wolf stated.